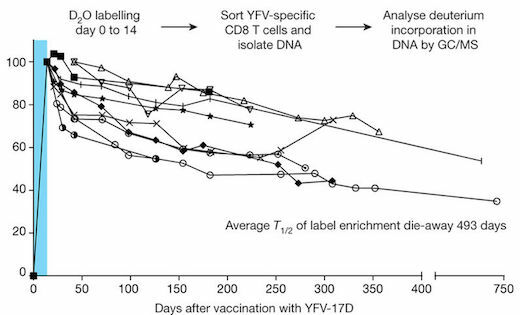 Heavy water labeling shows that cells destined to become memory T cells divide extensively for two weeks after YFV vaccination, and then divide rarely after that time. From Akondy et al Nature (2017). Memory T cells earn their name by embodying the memory of the immune system – they help the body remember what infections or vaccines someone has been exposed to. But to become memory T cells, the cells go backwards in time, relinquishing their status as immune foot soldiers. This is a key finding of two Nature papers, published on December 13. Their results inform a debate among immunologists about memory T cell development, with potential implications for vaccine design. Memory CD8 T cells are trained to kill cells that may have been infected by a virus or display a sign of not belonging. What distinguishes memory CD8 T cells from untrained naïve cells is that they can respond rapidly, within minutes or hours. The new research illuminates how the memory cells accomplish this – their genes are poised to respond, even years after initial activation, says Rafi Ahmed, PhD, director of Emory Vaccine Center and senior author of both papers. "When they become memory T cells, the cells dedifferentiate -- or, in effect, become young again. It's something we all want to do," he says. Ahmed and his colleagues came to that conclusion by tracking the patterns of gene expression and DNA methylation in memory CD8 T cells, and comparing them with naïve CD8 T cells and effector (foot soldier) cells. "We can see that memory CD8 T cells don't forget where they came from," says Ahmed, a Georgia Research Alliance Eminent Scholar. "They keep one foot in both naïve and effector tents." One paper examines mice acutely infected by an often-studied virus, while the other looks at immune cells from human volunteers immunized with yellow fever vaccine. The first author of the mouse paper is Ben Youngblood, PhD, now at St Jude Children's Research Hospital. The first author of the human paper, which uses heavy water labeling to follow immune cells over time, is Rama Akondy, PhD, assistant professor of microbiology and immunology at Emory University School of Medicine. The heavy water study was conducted in cooperation with the Hope Clinic of Emory Vaccine Center and the laboratory of Marc Hellerstein, MD, PhD at the Department of Nutritional Sciences and Toxicology, UC Berkeley. The debate about memory T cells, which can last for decades in the body, was whether they develop from effector cells, most of which die during an immune response, or directly from a subset of naïve cells. To address this question, researchers looked at genes that are turned on in naïve cells, off in effector cells, and then on again in memory cells. An example is the gene for L-selectin, an adhesion molecule needed for immune cells to home to lymph nodes. Memory precursor cells re-express genes such as L-selectin, and accomplish this shift by erasing previously acquired methylation on those genes, the Emory scientists found. In addition, the they showed that a DNA methylation enzyme is involved in restraining memory T cell development. DNA methylation is an epigenetic modification that usually turns genes off. Heavy water labeling is a technique that allows scientists to follow how often cells divide; deuterium is incorporated into every newly synthesized DNA or protein, occurring during cell division. Heavy water is not radioactive and has been used in clinical research since the 1930s. In volunteers who received the yellow fever vaccine and consumed heavy water, deuterium marked the effector CD8 T cells, Akondy says. The memory cells retained the label even after the volunteers stopped heavy water intake, showing that memory cells originated from the effectors, she says. The researchers could see that the vaccine-specific memory T cells came from cells that divided extensively in the first two weeks after vaccination. However, the memory cells calmed down after that, dividing less than once per year. Effector CD8 T cells produce high levels of granzyme B and perforin, tools for performing their "killer" functions. The scientists observed that long-lived human memory CD8 T cells do not contain the granzyme B and perforin proteins, but they also do not shut those genes off completely. The cells stay ready to plunge into action. "We think memory CD8 T cells retain an 'epigenetic signature' of having transitioned through the effector state," Akondy says. "The effector genes stay unmethylated and are poised to be re-activated." While these papers examine the development of memory CD8 T cells, Ahmed says the findings could be also relevant for memory CD4 T cells, a major reservoir for HIV persistence. Understanding how memory CD4 T cells re-activate could aid efforts to eliminate HIV from the body, he says. The research was supported by the National Institute of Allergy and Infectious Diseases (U19AI117891, R01AI030048, U19AI057266, R01AI114442, R01AI43866, UM1AI068618, UM1AI069481) and American Lebanese Syrian Associated Charities.